Suffering forms a part of man, it exists throughout his life. It is as deep as man himself. To experience this "Mysterious call" only brings one to silence. This mystery we cannot understand. Pain is universal and in this we somehow feel united to all those who suffer with us. No matter how surrounded you are by men, the sufferer is always alone in the desert of suffering. He is taken to the desert by his suffering. This is feared. People want the security of walls, people, shelter. The lonliness, the void, "Who can endure it?" Suffering comes and goes and people will react to it differently. Some offer it, some do not. 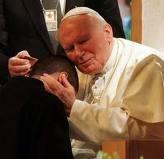 It is on this road of suffering that the Church meets man. You see, suffering brings out our limitations, our humaness. It also brings out compassion and respect in man because suffering contains the greatness of a specific mystery. Through pain, new truths come forth. These truths come up from within man. If you look at, accept and be aware of the pain, it does not paralyze you. The Bible is a great book about suffering, listing the many various painful situations for man. Whenever we suffer (in its psychlogical form) there is always an experience of evil which causes the person to suffer. It is a certain lack, limitation or distortion of good. Man suffers when cut off from, or does not share in, a good. We are left then, with one question: Why? All in the animal world expresses pain but only man knows he is suffering and wonders, why? And if he doesn't have an answer, he suffers all the more. Why is there "suffering" and "evil"? Man does not ask the world these questions, he puts this question to God, with all the emotion of his heart! God expects this question and listens to it as in the story of Job in the Bible. Job was a holy man that had terrible things happen to him. Even God said Job was innocent. Job's suffering is the suffering of someone who is innocent and here, it must be accepted as a mystery, which man is not able to understand. Yes, suffering is a punishment for sin, but not all suffering has the nature of a punishment. God can also be testing us. 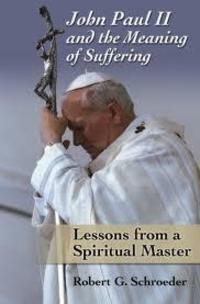 "It is suffering, more than anything else, which clears the way for the grace, which transforms human souls." There is another part - suffering changes people, it rebuilds goodness in the person, but this comes with great difficulty. Many try to run away from suffering, to distract themselves. They do not want to feel the pain, the void, the loneliness and they turn to "things" for pleasure. These things distract us but do not remove the pain and suffering. Everyone must face the human problems of suffering and dying. But it humbles us. Here we see we are limited. We must allow suffering to teach us, we must face the truth that in suffering, something is being done to us. Suffering has the capacity to change people. We can become better or bitter. We must allow it to make us better. The values we thought were important now crumble, only to see that these things somehow are replaced by "other" values. Once you get in touch, come into intimacy with yourself, do you have a deeper understanding of things. Only later, and in sometimes very different ways does the realization come that a change has happened, and the person who has suffered deeply, can see that nothing was, in fact, wasted. This is wisdom. Suffering, then, if you allow it to do what it can, opens you to its teaching and turns you into giver, lover, consoler. "Love", is the true source of the meaning of suffering, which always remains a mystery. By suffering, we somehow enter the mystery of God's love in the cross of Jesus Christ. 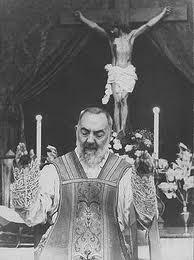 "Foolish are those who fail to fathom the secret of the cross" (Letters II). 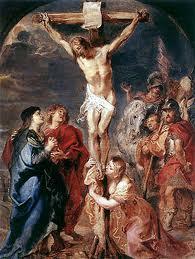 "Our Lord crucified you so that you do not run away and abandon Him and so that you remain always faithful to Him." Christ is the answer to the question. But we cannot help notice that the one to whom we question is Himself suffering and wishes to answer us from the cross - from the heart of His own suffering. Christ comes so close to those who suffer by the fact that He took up all our suffering in Himself. He experienced all the suffering we experience, to show us that, in Him, we can overcome all suffering. In His suffering, our sins are cancelled out. In the cross, human suffering changes. Suffering makes us somehow share Christ's work in saving the world. Suffering then, has a very special place in the Chruch for this reason. It is something good before which the Church bows down in reverence to this mystery. 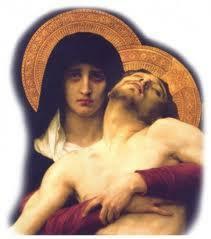 Here, our Blessed Mother holds first place in following the suffering road of Christ's Redeeming work. Here she becomes our model in suffering. We need only look to her. It is Mary who takes us by the hand and leads us in comfort to Her son's cross. In suffering, for Christ, there is hidden a particular power that draws a person interiorly close to Christ, leading to a maturity and spiritual greatness. When you suffer, Christ asks you to take a place close to Himself. When we have experienced His love and mercy, we are able then to turn back into the world and show others who are suffering the same love and mercy we have received. This is what we learn in suffering. Christ reveals to the sufferer, "secrets", and brings us slowly and effectively to the Father through his sufferings, This happens within the person. The sufferer is placed there, to look, to face the experience, to face God. You soon realize that even when pain is such an agony and you can't pray or utter a single word, the pain itself has become the most eloquent of prayers, if offered with Christ. The prayer of pain is the gift of pain. 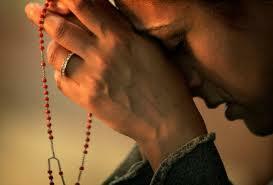 The great secret is to surrender to God, surrender even your wretchedness if that is all you have. Then you will see that fear will slowly disappear and that you are a changed person. The only thing that can be said at times is "I offer it to you, Jesus." It is at that moment we are joined to Christ on the cross with Him. The true and greatest effects of suffering can only happen in the depths of the person, the very silence and solitude from which they sprang. Suffering is an invitation for man to show how spiritually mature and great he really is. Here the great dignity of man is strikingly proved. The more he shares in the love of Christ, the more he discovers himself - he discovers his "Soul" which he thought he lost in suffering. Yes, it is a hard trial to which we are all subject. It is Christ's wish though, to show us His power and mercy especially when we are weak. Christ is united to all but most especially to those who suffer. How much He hungers to show us His Mercy and Compassion, when we especially suffer, if only we will let Him! When our eyes are on Christ and we willingly surrender to Him, in our sufferings, we lose interest in ourselves and find even a mysterious joy to be able to suffer for and with Him. This joy is the core of even the most intense suffering, a joy that no man can tell! Then and only then, man finds peace in his sufferings. They are not wasted. Once we understand the meaning of suffering in union with Christ, our depression is changed. We become partners with Christ, in saving our brothers and sisters!